Maxi-Cosi Rock is a lightweight baby carrier that is easy to use and offers good protection in the event of an accident. Just as I wrote earlier about the Kiddy Evoluna, this product is finally another seat in which a baby can lay flat. Another huge advantage what Maxi-Cosi is that probably it is one of the most popular brands that can be connected to most pushchairs – if you also want to use your baby carrier as a travel system, this baby safety seat can be one of the best options for you. Even though this seat can be used with a seatbelt, you are advised to get a FamilyFix One i-Size base to achieve maximum protection and click-and-go system by using the isofix installation. This seat can only be used until about 1 year, but the same base can be used with Pearl Smart i-Size seat up to four years. You will only need to change this seat to the next one when the top of your baby’s head reached the upper edge of the seat. Maxi-Cosi Rock has a material that is developed to absorb the impact of a possible crash in addition to its side protection that is added to the top side wings. It also has baby-hug inlay to secure and comfort newborn babies and is advisable to be used up strongly recommended to be used up to 60 cm. Another great advantage of the seat is that you can remove the cover without having to dismantle the harness and you can put it right away to your washing machine. The seat is approved to be used on certain airplanes, but make sure to consult the airline before booking if this type of seat is allowed on the chosen flight. Additionally, you can also buy matching Maxi-Cosi footmuff, summer cover, rain cover and mosquito net. According to the manufacturer, the infant carrier should not be used for more than five years. Do not use on passenger seats with front airbag! You can find out if this seat fits into your car by clicking here. 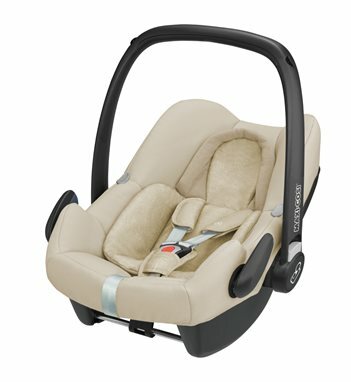 I hope you liked this review and if you have any question about the Maxi-Cosi Rock seat both with and without the FamilyFix One i-Size base or want to leave your own personal experience, leave a comment below.